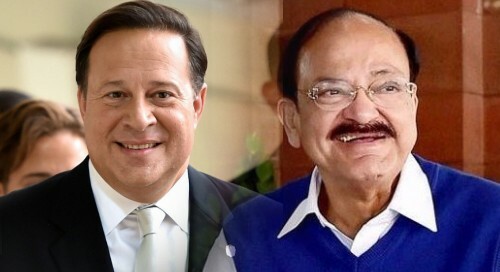 Panama City, May 10 (IANS) Panamanian President Juan Carlos Varela met here on Wednesday with the Vice President of India, M. Venkaiah Naidu, to whom he proposed using Panama's logistics platform as a means to expand Indian presence in Latin America. "We want to help India strengthen its competitiveness in world trade by means of our logistics platform," Varela added. The Panamanian President said that he had agreed to build a "much more robust" bilateral agenda with the Indian Vice President, focusing on establishing "technological, scientific and agricultural" projects, as well as promoting tourism. Naidu's visit to Panama takes place a month after the Panamanian government announced the liberalization of visa requirements for tourists from India, a decision which could have a positive effect on tourism and trade, Varela explained. The Panamanian president also said that his meeting with Naidu was part of a larger foreign policy aimed at strengthening Panama's ties with "Asian and Middle Eastern emerging markets, regions with which we have not had close relationships." "India is the fifth largest economy and the second most populated country in the world. India's success is linked to its rich culture and its commitment to entrepreneurship, science, innovation, technology and a highly-qualified workforce," Varela said. Naidu thanked the Panamanian government for liberalizing its visa requirements and praised the Central American country for its economic dynamism.